My book is finally done! iOS Programming for .NET Developers has been a labor of love. 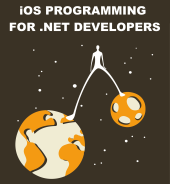 I wrote this book to help .NET devs leverage their existing skills to understand iOS programming. When I first moved to the iOS world no book like it existed, but I sure wish it had. The book explains iOS development by comparing and contrasting it with tools, APIs, and concepts familiar to .NET developers. For example, it compares Xcode to Visual Studio, and Objective-C to C#. After working on large, successful enterprise iPhone and iPad applications, I felt it was time to help other .NET devs pick up this valuable skillset. I have created a free PDF sample of the book. Download it here. Q) Is there any difference between the iBooks and Kindle editions? A) Yes, there is a visual difference. The iBooks edition has better looking images than the Kindle edition. Amazon “converts” a book’s images by reducing their quality during the publishing process, in order to make book files smaller and faster to download. Apple does not alter the images, so they look much better. If you have a choice, buy the iBooks edition. Both editions are the same price. Q) Is the book’s source code properly formatted? A) I put a very high priority on having the best source code formatting and legibility possible. That’s why I spent many hours taking screenshots of the book’s code examples, instead of just pasting them into the book. Each code example in the book looks exactly like how it looks in the Xcode IDE. Q) Can the book be bought via PayPal? A) Yes, the paperback edition can be bought via PayPal from Lulu. Is there any visual or functional difference between the Kindle and iBooks versions? There is a visual difference. The iBooks edition has better looking images than the Kindle edition. Amazon “converts” a book’s images by reducing their quality during the publishing process, in order to make book files smaller and faster to download. Apple does not alter the images, so they look much better. If you have a choice, buy the iBooks edition. Wouldn’t mind buying it, but can’t seem to buy it from Kindle because it doesn’t sell to Asia/Pacific (I’m in New Zealand). Is there a PDF or something I can buy? Cheers! Sorry about that Chris. You can order a paperback copy, which is the same price as the eBook editions. There is no way to purchase a PDF copy of the book. If you’re like me and still like physical books, Lulu.com has a coupon code for 20% off your order – it’s JULYBOOKS12 (case sensitive.) This takes $8.00 off the price of the book. The more you know! Wow, that’s cool! Thanks for sharing, tsfroggy. Just ordered my copy, btw. This is exactly what I’ve been looking for, so thanks for writing this! Can’t wait to get my copy! The book is a great read and is easing the transition to iOS developing (although Objective-C still looks hideously complicated and archaic). The examples are great (I always knew ninja’s would come in handy one day). Hopefully one day it will all start to make sense. I really appreciate the feedback, Alastair! I checked out the sample, and notice that the book was written against Xcode 4.3. Is there an update planned for Xcode 4.4? It is my understanding that the new version of Xcode is different enough to make older books very frustrating for someone unfamiliar with the IDE. There is no update for the new version of Xcode. There is no need for that. The differences between Xcode 4.3 and 4.4 are very minor. I think what you are referring to is the difference between Xcode 3 and 4, which is huge. Apple totally revamped the IDE when releasing Xcode 4. Is there any chance of making your book available to kobo users? Hi Jason. I will look into what’s involved with publishing to Kobo. This is the first I’ve heard of it, so thanks for asking! Thanks Josh, If you find that it is not worth it, I can just purchase the kindle version and convert to kobo format. I looked into publishing on Kobo. It turns out that I can’t do it, because their maximum book file size is too small for my book. No worries! I will get the kindle version. I just finished your book, and all I can say is thanks! I finally get it. Thanks JasonD! The price of a color edition from Lulu was very high, around $100 just to print it. I assumed nobody would want to pay that much, so I didn’t bother making it an option. I read the book and must congratulate you for a job well done. The book came at the right time for me because my manager came to our team and said we have a month to get ramped up with ios and then we start on an iPad app. A week later you released the book and I was like Thank You Lord for answering my prayers. The book is exactly as you say it is. A translator. A field guide. The other book I was reading about ios didn’t make much sense since it is so weird for .net guys. Your book is at my desk everyday next to my MacBook. I soapboxed about it with my team and now some of them are reading it, so your teachings are a blessing for my team and our small company. That’s great! Thanks for letting me know, James. You mentioned that the iBooks edition looks better than the Kindle edition. How is the Nook version? This book was recommended to me by Tim Corbett. It does a great job filling the void for those wanting to expand to the strange world of objective-C/Xcode. Exactly what I’ve been looking for! Thanks Josh. I’m glad my book helped you out, Cullen. Thanks for letting me know! Pingback: iOS 6 Feast Week 1 Update! Got a question for you Josh, does your book cover control or class library authoring? How does this differ from .NET where you create a dll to redistribute user controls? Also, is there any difference in authoring a control for iOS and OSX so it can be used on iPad as well as Mac desktop/laptops? PS: I’ve joined the dark side, bought Macbook pro and running Win7 in Parallels VM for now. Tempted to break open xcode, but have plenty of .NET work to finish for now! Cheers Josh, I guess your book is a great place to start regardless of the above questions. As you may see by my website URL on this post, I have authored a WPF/Silverlight commercial control. One of the forks on the roadmap is to investigate a port to iOS / Mac OSX. I guess in this case compiling controls to a static library would make sense as opposed to redistributing code. Seems reasonable. You might want to check out Shinobi and see how they distribute their iOS controls. Pingback: iOS 6 Feast Giveaway Winners! Thanks for your post on moving to ios dev, also. I’m going to go the mac mini route, since I have an extra monitor/keyboard/mouse, all not being used. I don’t know, Steve. I use a WP blog hosted by WP, not a custom site. Could you help me. How can I book iBooks edition? It doesn’t exist at Ukrainian store. So I can’t purchase. ArtemGrygor, thanks for asking me about this. I looked into it on the administrative site for iBooks authors and could not find a way to publish the book in Ukraine. I emailed Apple for help. I will let you know once I hear back from them. ArtemGrygor, I got a reply from Apple. It wasn’t very helpful, just told me to make sure I had accepted the latest iBookstore contract and made my book available in all territories they support. I checked, but Ukraine was not in the list. Sorry, but it appears I can’t help you. Have you considered buying a paper copy, or buy it for Kindle from Amazon (you can read Kindle books on the iPad)? I would like to purchase the iBooks version but is not available in my country. Is there anything you can do on your end to make it available? I’m currently living in Mexico and will be here for a while but I’m really interested in your book. David De Smet, I just recently accepted a new contract with iBookstore and was able to sell the book in many more countries. Mexico is in the list, so it should be available for purchase at this time. If not, please let me know. Thanks a lot for the great review! I’m glad my book helped you out. From all the comments it sounds like this book is a valuable resource but I wonder if it is available in PDF or HTML format as I dislike most book reader’s terse approach with fixed pages, etc. The inability to easily scroll up/down drives me nuts. Thanks! It isn’t published in PDF or HTML format. The book looks great, thanks! Just ordered my paperback copy.